Me again, another OOTD. You know the drill by now, folks. Ripped jeans are something I never really saw myself wearing, but when I spotted these in the Missguided sale I thought hey - why the heck not? They fit like a glove and just love 'em. My top is a Primark basic crop top that I bought last year alongside a grey one, and I chuck these on aaaalll the the time with various things. 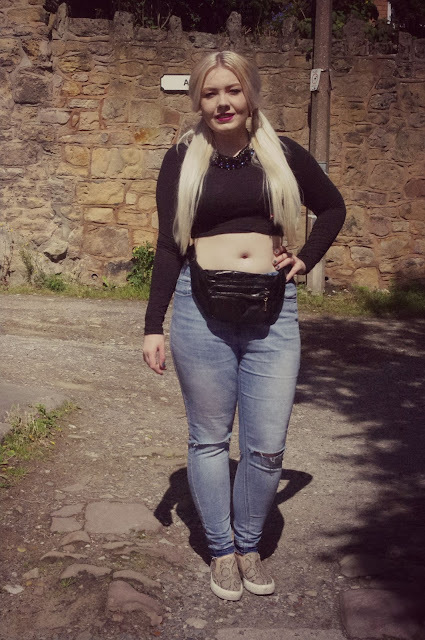 Bumbags are such a summer staple, and even though we're edging into Autumn I still love mine. It's from Missguided again, as are my snake print slip-on shoes which are sooooo comfy. My necklace is also from Missguided (y'all sensing a theme - I did win a year's supply of clothes from there, so you see my reasoning...) and it's not something I'd usually go for but it looks so pretty on! Sorry this one is so photo-heavy, but as Kim K would say - I was feelin' my look!!! You look great and feel great and that speaks volumes through pictures.